Krystyna Biel, CEO and Nicole Jelley, Board Chair. Photo by Riverwood Photography. Established in 1977, the Calgary Immigrant Aid Society set out with one employee, a volunteer and seven board members to provide newcomer services in Calgary. As the city grew and changed, so did the organization. Today, it is called Immigrant Services Calgary and is fuelled by the dedication of 150 staff and over 1,300 volunteers. “We are very proud of our 40-year history. 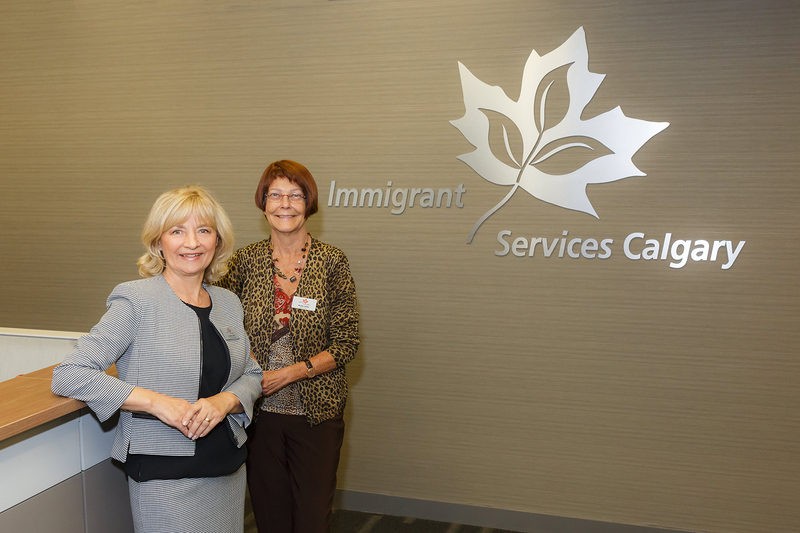 We have grown into one of the longest-serving and most comprehensive settlement agencies, helping newcomers succeed in many areas,” says Krystyna Biel, CEO of Immigrant Services Calgary. Immigrant Services Calgary (ISC) has innovative programs in place to assist newcomers with everything from family support to employment resources. ISC’s aim is to help immigrants integrate into their communities by offering services in all areas of their life, both personal and professional. ISC’s Mosaic Family Resource Centre supports families, young children and youth throughout the integration process. This can include mentorship and academic support for youth; addressing maternal and newborn health for pregnant women and new moms; developing literacy initiatives; preschool programs with parental engagement; and providing support and social networks. Mosaic also offers counselling services for individuals, couples and families and it is built on relationships that continue after clients have completed their program. 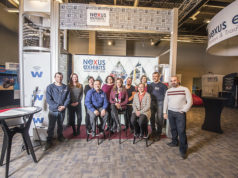 “The Mosaic Family Resource Centre is based on a holistic model where programs for one family member include support elements for the rest of the family,” says Mosaic director Wendy Auger. ISC recognizes the importance of building networks and a sense of community to prevent isolation. It strives to provide easy access to resources and services to ensure newcomers don’t fall through the cracks. ISC’s Settlement and Language Bank Centre (SLBC) facilitates successful settlement and integration – with most services delivered in newcomers’ first language, with interpretation and translation services where needed. SLBC also offers citizenship classes to prepare newcomers for the citizenship test and encourage active civic participation. “We act as a bridge between newcomers and various resources so they won’t get left behind because of language, cultural or social barriers,” says Ho-Man Chan, Settlement and Language Bank director. After all, language should never be a barrier to integrating into another country, and ISC works hard to ensure clients have easy access to language resources. ISC’s Immigrant Language and Vocational Assessment-Referral Centre (ILVARC) is the first point of contact for many immigrants and refugees. There, teams of assessors and counsellors provide same-day language testing and referrals to English classes and other resources. After assessment, ISC connects clients to language training opportunities to advance their educational and vocational goals and their employability skills. While some immigrants don’t speak the language well enough to be immediately considered for work, a large number of newcomers have professional training and already possess the language proficiencies required to work in their field. ISC is proud to work with clients to help pair them with local companies looking for staff, even before they arrive in Canada. In partnership with In-TAC and Immigrant Services Society of BC, ISC delivers pre-arrival services online to newcomers across Canada as well as immigrants preparing to come from overseas. The organization presents a series of pre-arrival virtual programs that include online workshops, job fairs and hiring sessions that allow immigrants to hit the ground running when they arrive. In September, ISC hosted a Virtual Career Expo that attracted nearly 3,000 participants and featured 1,300 job opportunities from 52 employers across the country. “The purpose is to spread awareness, give hope to newcomers and help them overcome the inclusion, diversity and employment barriers that an immigrant or refugee can face after landing,” says Ghazi Hallab, business development officer for ISC’s pre-arrival program. The expo successfully connected immigrants and immigrants-to-be with companies in desperate need of their skill set and knowledge base. This valuable initiative allows employers to see how deep the foreign talent pool is and gives them access to these professionals, and it allows immigrants a look at the economic situation in the area and get an idea of whether they have to apply for accreditation or alter their career path to be successful. The Voices of Calgary Campaign introduced an online and social media platform on which immigrant professionals could share their stories. Through social media and the www.voicesofcalgary.com website, ISC posts videos that highlight the struggles and successes of internationally-trained professionals and tags others to spread the word. They also spotlight employers who are active in hiring from the foreign-trained talent pool. 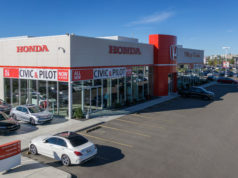 “The idea is we want to encourage an inclusive and equal opportunity workplace for immigrants as well as have support and recognition of foreign credentials here in Calgary,” says Noel Tsang, project coordinator of Voices of Calgary. ISC also hosted a symposium in October to discuss the competitive advantage immigrant professionals bring to Calgary’s workforce, inviting a dialogue between employers, community members, accreditation boards and immigrants. And that role is vital. Immigrants are a great source of talent in many professional areas, especially in the technology field, and their skills are needed to meet the changing needs of Canadian businesses. 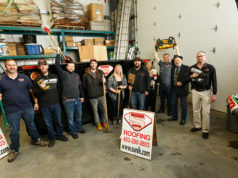 “At the end of the day, it’s about talent, specific skills and competencies to meet the needs of Calgary’s employers, regardless of provenance,” says Nicole Jelley, board chair of ISC. One only has to look around the community to appreciate the success of so many of these people. For the past 22 years, ISC has honoured local newcomers with the Immigrants of Distinction Awards. These awards recognize and celebrate the contributions immigrants make in the community in such areas as entrepreneurship and innovation, community service, arts and culture, organizational diversity, and youth scholarships. The gala event awards 12 remarkable individuals annually, but ISC takes continued pride in celebrating many more throughout the year. “Inspire Support Connect” is the theme of the gala on March 9, 2018. ISC invites the community to celebrate Calgary’s global talent. Newcomers are making an enormous impact on communities as well as the business world across the country, and Immigrant Services Calgary will build on its 40-year legacy to ensure newcomers have the resources needed to continue to do so for decades to come.